To celebrate the theme of Sound, we invited Sara Auster, a Sound Therapy Practitioner, to help the community end the year well by tuning inward towards our thoughts and intentions. Sara Auster is changing the way the world is engaging with sound and the act of listening. As a sound therapist, meditation teacher, speaker, and artist, she has been a driving force in bringing sound baths to contemporary culture. Sara navigates the space between science and art as she intertwines the benefits of sound with a musician’s gift for creating moments of transcendence. Through carefully crafted live experiences and recordings, she allows sound to be used as a tool to access meditative states, support self-inquiry, cultivate deep relaxation, and inspire meaningful connection and change. 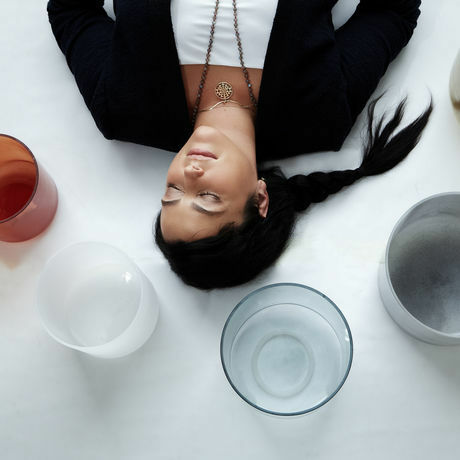 Sara’s work in making meditation and sound baths accessible to all, has gained her international recognition as a leading voice in the wellness movement. She has been invited to speak about mindfulness and sound therapy for companies such as Google, Microsoft, and American Express. Sara has facilitated sound baths in public schools, shelters, correctional facilities, and hospitals as well as iconic locations including Lincoln Center and Madison Square Garden, in addition to museums and cultural institutions such as Palais de Tokyo, Mass MoCA, and MoMA. Her work has been featured in several global media outlets including: The New York Times, Time Magazine, Vice, Quartz, Billboard Magazine and was named a top meditation teacher by O Magazine in 2016.